Mahvash Zaeri (Facebook), May 27, 2018. Shahnam Jadhbani ( شهنام جذبانی ) is reported to have been arrested in his home in Minudasht and taken to Gonbad to begin serving a sentence that may be as long as eleven years. He and his wife Shohreh Samimi ( شهره صمیمی ) were arrested in Minudasht in October 2012. Around the same time, 20 other Bahais were arrested in Golestan Province by agents from the Ministry of Intelligence, acting without warrants. Many Bahai homes homes were searched, with the seizure of computers, books and family photo albums. They were initially given very long sentences, but these were all reduced by the review court to less than two years, except that review court did not at that time announce its decision on the cases of Shahnam Jadhbani ( شهنام جذبانی ) from Minudasht and Shayda Qodousi (شيدا قدوسي) from Gorgan, who were sentenced to 11 years in prison. Mr. Jadhbani’s sentence may also have been reduced, in which case that will be reported within the next few days. Bahai News (Persian), May 31, 2017. Kamellia Bidelyan (کاملیا بیدلیان), a Bahai from Minudasht, reported to prison on May 31 to begin her 18-month sentence [presumably the Minudasht prison ~ sen]. Security forces attempted to arrest her a week previously, but since her neighbours objected they instead left a message that she should report today to the Ministry of Intelligence. Her husband Navid Mo`allem (نوید معلم) was arrested on March 12, in front of his place of business, and transferred to prison to begin his own 18-month sentence. 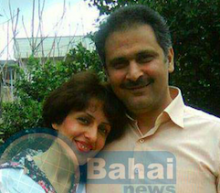 The couple are among 22 Bahais detained on October 17, 2012, in a wave of arrests of Bahais in Gorgan and Minudasht. Bahai News (Persian), April 30, 2017. Navid Mo`allem (نوید معلم), a Bahai resident of Minudasht in Golestan Province who was arrested on March 13, has been allowed to meet his wife Kamellia Bidelyan (کاملیا بیدلیان) in prison, 48 days after his arrest. He and his wife were among 22 Bahais of Golestan Province who were arrested on October 17, 2012. He was sentenced to 18 months in prison. Iran Press Watch, March 23, 2017. Another informed source has conveyed that within the past few days, security agents also went to the home of one of the other Bahais who has been sentenced to imprisonment, but he has not been arrested, since he was not home. Based on this report, security agents in this province are eager to implement the prison terms of those Bahai citizens who had previously been sentenced by the court of appeals. During the original court hearing, 22 Bahais of Golestan Province who were , arrested on October 17, 2012 were sentenced to a total of 193 years of imprisonment. Following their hearings at the court of appeals, it was announced that Farah Tebyanian (فرح تبيانيان), Puna Sana’i ( پونه ثنایی), Mona Amri Hesari (مونا امري حصاري), Behnam Hassani (بهنام حسني), Parisa Shahidi ( پریسا شهیدی ), Mojdeh Zouhori (مژده ظهوري), Parivash Shoja`i ( پریوش شجاعی ), Tina Mauhabati ( تینا موهبتی ) and Hana Aqiqiyan (هنا عقیقیان), all from Gorgan; Shohreh Samimi (شهره صمیمی) from Minudasht; Bita Hedayati (بيتا هدايتي), Vesaq Sana’i ()وثاق سنايي and Hana Kushkabaghi ( هنا کوشکباغی ) from Gonbad-e Qabus had their prison sentences reduced from 9 years to one year and nine months. According to this report, the one year and nine month prison sentence of Tina Mohebati (تینا موهبتی) was later overturned, and she was sentenced to pay a three million tuman (approx US$925) fine. Rufeya Pakzadan ( روفیا پاکزادان), Soudabeh Mehdinezhad ( سودابه مهدی نژاد ), Mitra Nouri ( میترا نوری ), Shiva Rouhani ( شیوا روحانی ), Houshmand Dehqan (هوشمند دهقان), Mariyam Dehqan (مريم دهقان) and Nazi Tahqiqi (نازي تحقیقی), all from Gorgan, along with Kamelia Bideli (کاملیا بیدلی) and Navid Moalem (نوید معلم) from Minudasht, had their sentences reduced from 6 years to 18 months. The review court did not anounce its decision on the cases of Shahnam Jadhbani ( شهنام جذبانی ) from Minudasht and Shayda Qodousi (شيدا قدوسي) from Gorgan, who were sentenced to 11 years in prison. The Bahais were charged with collaborating with hostile governments, effective activities to promote the goals of a sect and of anti-Islamic and anti-Shiah hostile governments, and with making propaganda in favour of the Bahai Faith and against the regime of the Islamic Republic, by participating in the ‘Ruhi program’ (Bahai catechism) in Golestan Province. The sentencing by the court of appeals of Shahnam Jazbani (from Minudasht) and Shayda Ghoddousi (from Gorgan), who were each sentenced to 11 years of imprisonment, has yet not been communicated to them. Bahai News, November 2, 2016. In January this year, a court in Gorgan which began hearing the cases of small groups of Bahais in April, 2015, issued sentences in 24 cases. These 24 Bahais have been free on bail, pending the ruling of the Review Court for Golestan Province, which reviewed the cases on September 18 and 29, and has now announced its decision on most of these cases. Farah Tebyanian (فرح تبيانيان), Puna Sana’i ( پونه ثنایی), Mona Amri Hesari (مونا امري حصاري), Behnam Hassani (بهنام حسني), Parisa Shahidi ( پریسا شهیدی ), Mojdeh Zouhori (مژده ظهوري), Parivash Shoja`i ( پریوش شجاعی ), Tina Mauhabati ( تینا موهبتی ) and Hana Aqiqiyan (هنا عقیقیان), all from Gorgan; Shohreh Samimi (شهره صمیمی) from Minudasht; Bita Hedayati (بيتا هدايتي), Vesaq Sana’i ()وثاق سنايي and Hana Kushkabaghi ( هنا کوشکباغی ) from Gonbad-e Qabus had their prison sentences reduced from 9 years to one year and nine months. The Bahais were charged with collaborating with hostile governments, effective activities to promote the goals of a sect and of anti-Islamic and anti-Shiah hostile governments, and with making propaganda in favour of the Bahai Faith and against the regime of the Islamic Republic, by participating in the ‘Ruhi program’ (Bahai catechism) in Golestan Province. Three of the women mentioned above have husbands who are already in prison, and who have not been allowed any prison furlough. Their husbands were in a group of seven Bahai men from Gorgan who were sentenced in May 2013. Punah Sana’i is the sister, and Farah Sana’i is the wife, of Fahrmand Sana’i (فرهمند سنایی), who was sentenced to five years; Parisa Shahidi is the wife of Kamal Kashani (کمال کاشانی), also sentenced to five years; and Mojdeh Zouhori is the wife of Farhad Fahandezh (فرهاد فهندژ), who has been sentenced to 10 years in prison. Among the 22 Bahais whose sentences have been reduced, Shohreh Samimi is the wife of Shahnam Jadhbani, while Kamelia Bideli is the wife of Navid Moalem (whose name was previously reported as Navid Moalemi (نوید معلمی)). Shahnam Jadhbani ( شهنام جذبانی ) and Navid Mu`allem ( نوید معلم ), two of the Bahais detained on October 17 in a wave of arrests of Bahais in Gorgan and Minudasht, were released on bail on December 4. It is reported that Shahnam Jadhbani suffered a heart attack during his detention, and spent 3 days in hospital, but was then returned to his cell and remained there for a month, despite suffering severe pain. Shohreh Samimi and Kamelya Bidelyan ( شهره صمیمی و کاملیا بیدلیان ), two of the Bahais detained on October 17 in a wave of arrests of Bahais in Gorgan and Minudasht, have been released on bail. They had been held in Gonbad prison, near Minudasht. Shahnam Jadhbani ( شهنام جذبانی ) the husband of Shohreh Samimi, and Navid Mu`allemi ( نوید معلم ), the husband of Kamelya Bidelyan, were arrested at along with their wives, and after a month in Gonbad prison, were transferred to Gorgan. Shahnam Jadhbani has not yet had any contact with his family. In an update and correction of the previous report of the arrest of Shahnam Jadhbani ( شهنام جذبانی ) and his wife Shohreh Samimi ( شهره صمیمی ) in Minudasht, Golestan Province, and Navid Mu`allemi and his wife Kamelya Bidelyan ( نوید معلمی و کاملیا بیدلیان ) in the provincial capital, Gorgan, PCED reports that these four were in fact arrested in Minudasht, and adds the names of those arrested in simultaneous raids on Bahai homes in Gorgan. The arrests, by agents from the Ministry of Intelligence, were made without a judicial warrant. Bahai homes homes were searched, with the seizure of computers, books and family photo albums. The names of those arrested in Gorgan are given as Parivash Shoja`i, Bhenam Hassani, Nazi Tahqiqi, Houshmand Dehqan, Farhad Fahenadzh, Fahrnaz Tabayanian and his wife Fahrmand Sana’i, Shayda Qodousi, Shiva Rouhani, Mitra Nouri, Hana Aqiqiyan, Kamal Kashani, Puna Sana’i, Soudabeh Mehdinezhad and Mariyam Dehqan ( پریوش شجاعی(فنائیان)، بهنام حسنی، نازی تحقیقی(خلخی)، هوشمند دهقان، فرهاد فهندژ، فرحناز تبیانیان و همسرش فرهمند سنایی، شیدا قدوسی، شیوا روحانی(موهبتی)، میترا نوری(موهبتی)،هنا عقیقیان، کمال کاشانی، پونه سنایی، سودابه مهدی نژاد و مریم دهقان. ). Agents also raided the home of Rufiya Pakzadan and Maral Roushani ( روفیا پاکزادان و مارال روشنی ) and seized some of their personal effects, but did not arrest them as they were not home. There were also raids on other Bahai homes, including those of Siamak Sadri, Foad Fahandezh and Katarin Sana’i ( سیامک صدری،فواد فهندژ و کاترین سنایی ), in which some belongings were confiscated. In some of the raids, the agents’ behaviour was violent, with insults and beatings and even damage to the house. The reasons for the arrests, and the whereabouts of those arrested, are still unknown. On the morning of October 16, agents from Iran’s Ministry of Intelligence in Golestan province (formerly part of Mazandaran, in the Northeast), staged simultaneous arrests of a number of Bahais. In the city of Minudasht, the home of Shahnam Jadhbani ( شهنام جذبانی ) and his wife Shohreh Samimi ( شهره صمیمی ) was searched, and the couple were arrested. At the same time, in Gorgan, the provincial capital, agents arrested Navid Mu`allemi and his wife Kamelya Bidelyan ( نوید معلمی و کاملیا بیدلیان ) and several other Bahais.